The Ebers papyrus, from about 1550 BC contains a description of the treatment of asthma. It is written in the Egyptian language. The Egyptian language was the language spoken in Ancient Egypt. It has a written history of about 5000 years, which makes it one of the oldest written languages known today. The Coptic language is the modern form of the Egyptian language. The Copts, a Christian minority in modern-day Egypt, use it for religious purposes. A few people are still fluent in Coptic. While the modern variant is known, the older variants could only be translated when the Rosetta stone was found in 1799. The Rosetta stone contains the same text in three languages, one of which was known at the time. The oldest records of the Egyptian language date from about 3400 BC. Egyptian was spoken until the late 17th century AD in the form of Coptic. The national language of modern-day Egypt is Egyptian Arabic, which replaced Coptic as the language of daily life in the centuries after the Muslim conquest of Egypt. Middle Egyptian language (2055 BC – 1650 BC), the Middle Kingdom (2055 BC – 1650 BC, but lasting until the Eighteenth Dynasty of Egypt: Amenhotep III, Akhenaten and the Amarna period (1353 BC). It continued as a written language into the 4th century AD. Late Egyptian language (1069 BC – 700 BC), the Third Intermediate period (1069 BC – 700 BC), but starting earlier with the Amarna period (1353 BC). Egyptian writing in the form of labels and signs has been dated to 3200 BC. These early texts are generally called "Archaic Egyptian." In 1999, Archaeology Magazine reported that the earliest Egyptian glyphs date back to 3400 BC which "...challenge the commonly held belief that early logographs, pictographic symbols representing a specific place, object, or quantity, first evolved into more complex phonetic symbols in Mesopotamia." Old Egyptian was spoken for about 500 years from 2600 BC onwards. Middle Egyptian was spoken from about 2000 BC for a further 700 years when Late Egyptian made its appearance; Middle Egyptian survived until the first few centuries AD as a written language, similar to the use of Latin during the Middle Ages and that of Classical Arabic today. Demotic Egyptian first appears about 650 BC and survived as a spoken language until the fifth century AD. Coptic Egyptian appeared in the fourth century AD and survived as a living language until the sixteenth century AD, when European scholars traveled to Egypt to learn it from native speakers during the Renaissance. It probably survived in the Egyptian countryside as a spoken language for several centuries after that. The Bohairic dialect of Coptic is still used by the Egyptian Christian Churches. Old, Middle, and Late Egyptian were all written using hieroglyphs and hieratic. Demotic was written using a script derived from hieratic; its appearance is vaguely similar to modern Arabic script and is also written from right to left. 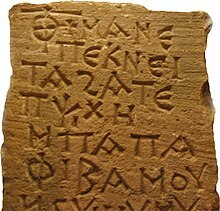 Coptic is written using the Coptic alphabet, a modified form of the Greek alphabet with a number of symbols borrowed from Demotic for sounds that did not occur in contemporary Greek. Arabic became the language of Egypt's political administration soon after the Arab conquest in the seventh century AD. Over time, it replaced Coptic as the language spoken by the common people. Today, Coptic survives as the liturgical language of the Coptic Orthodox Church and the Coptic Catholic Church. ↑ The language may have survived in isolated pockets in Upper Egypt into the 19th century according to James Edward Quibell, "When did Coptic become extinct?" in Zeitschrift für ägyptische Sprache und Altertumskunde, 39 (1901), p. 87. ↑ Bard, Kathryn A.; Steven Blake Shubert (1999). Encyclopedia of the archaeology of ancient Egypt. Routledge. p. 274. ISBN 0-415-18589-0. This page was last changed on 9 February 2018, at 22:06.